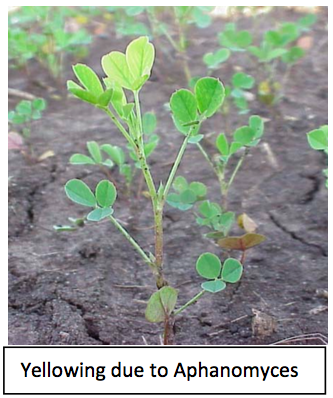 Aphanomyces root rot (Aphanomyces euteiches) is an important alfalfa disease. It occurs all over the Midwest U.S. The pathogen that causes Aphanomyces root rot is an oomycetous fungi that are especially present in wet and poorly drained soils (Schneider et al. 2008). Aphanomyces stunts and kills seedlings. Currently there are two dominant races, Race 1 and Race 2, with Race 2 considered more virulent. 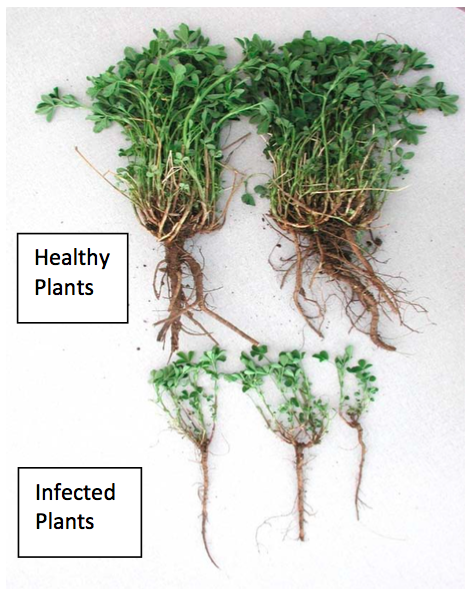 Infection of alfalfa is due to zoospores, which are motile in wet soils over a very wide temperature range. Infected seedlings develop yellow cotyledons followed by chlorosis of other leaflets. Roots and stems initially appear gray and water-soaked and then turn light to dark brown. Seedling become stunted but remain upright. 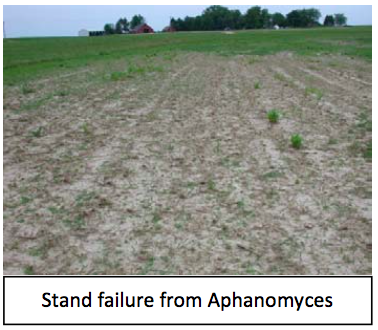 Seedlings that die can result in stand failure as shown to right. Aphanomyces also causes a chronic root disease in established plants, reducing root mass. Nodules are frequently absent or in some stage of decay. Infected plants show yellowing and stunting symptoms similar to nitrogen deficiency and are slow to regrow following winter dormancy or harvest. The slow regrowth often allows weed infestation over time. Symptoms typically appear on slopes of fields. Most improved alfalfa varieties have Race 1 resistance. Better varieties have Race 2 resistance (actually multiple race resistance including Race 1). If you planted a race 1 resistance variety and still have the disease, select a variety with Race 2 resistance. References: Schneider, N., Grau, C., Hudelson, B., and Gibbs, A. 2008. Aphanomyces Races in Alfalfa. Focus on Forage Vol. 10, No. 7.